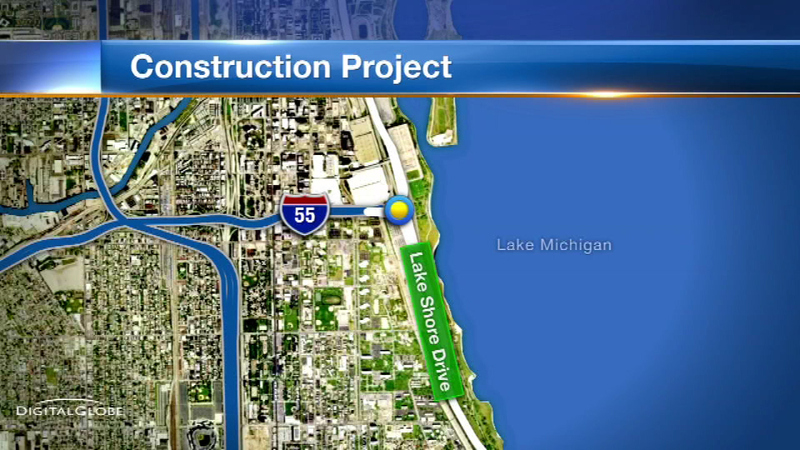 CHICAGO (WLS) -- Construction on the northbound Lake Shore Drive ramp that connects to outbound Interstate 55 starts this week causing closures and lane reductions starting Thursday, weather permitting. The ramp will be closed 1 a.m. to 5 a.m. on both Thursday and Friday, according to the Illinois Department of Transportation. During the closure, the northwest ramp will be reduced to an 11-foot lane width for about a 1,500-foot stretch. Occasional overnight closures may occur while construction is ongoing. The reconstruction of the southbound Lake Shore Drive ramp to outbound I-55 will begin later this summer and last until winter 2016. The ramp construction is part of a $133-million project to rebuild all the ramps and bridges linking I-55 and Lake Shore Drive, just east of the Dan Ryan Expressway. The work consists of the reconstruction and reconfiguration of the six bridges that form the interchange.